Applies pesticides for a business, on land owned by someone else, and usually for hire. and applicators who apply to publicly-accessible sites (apartment complexes with four or more units, restaurants and food service establishments, day care centers with preschools, hospitals and medical centers, and golf courses). A list of commercial categories can be found here. ODA will send a set of study materials to the applicator. Allow 4-6 weeks for materials to be delivered. Study the materials. New applicator schools are optional to help prepare for the test. Click here to see if any schools are scheduled. Select an exam date and site. The exam is offered around the state of Ohio each year. Click here for the exam dates and sites. If the applicator did not pass an exam, they are able to retake the test. Only the exams not passed need to be retaken. A business license is required for a business that applies to the property of another for hire, or solicits and takes orders to apply pesticides. It is also required for a business that conducts wood-destroying insect diagnostic inspections in a contemplated real estate transaction. Send application form to ODA with $35 fee. Click here for a business application form. A business license requires proof of liability insurance. See the business application form for the amounts. No testing is required for a business license. A business must have at least one person in the company with a Commercial Applicator License. Business license - ($35) License application for a business that applies pesticides to the property of another for hire, or solicits and takes orders to apply pesticides, or conducts diagnostic inspections for wood-destroying insects (WDI) in a contemplated real estate transaction. Solicitation business license - ($35) License application for a company that solicits only to obtain business. This license type is prohibited from making pesticide applications. 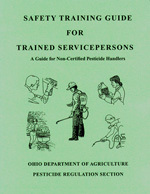 A solicitation company contracts with a licensed pesticide business in Ohio to perform applications. Pesticide registered location - ($35) License application for any additional location or branch of a business operating in Ohio with the same name of a Pesticide Business that already has a pesticide business license in the state of Ohio. Pesticide dealer - ($35) License application for a person or facility who distributes or sells restricted-use products to licensed commercial or private applicators. Complete mandatory training for Wood-Destroying Insect Inspection (click here for next class). Apply for a commercial pesticide applicator license. To receive the study materials to prepare for the exams, submit the license application and $35 fee for a pesticide applicator license. Select the materials for Core and Category 12 (WDI). You will receive a packet of study materials for these two exams that you will be required to take. The core exam covers general laws, regulations, and safety and the category 12 (WDI) exam is specific for inspections. Take the Core and Category 12 exams for the commerical applicator license. Click here to see test schedule and register. You can also register by calling (614) 728-6987 to schedule an exam. Exams are available at the conclusion of the mandatory training class. You may take the exams prior to the class, if you would like. The class only covers Category 12 material. Core will not be covered. If you would like a to attend a core study session, sign up for the first half of the day of the New Applicator Training. The business license must also have errors and omissions for Wood-Destroying Insect Inspections with the liability insurance. Take the Category 12 exam for the commerical applicator license. Click here to see test schedule and register.You can also register by calling (614) 728-6987 to schedule an exam. A trained serviceperson is an applicator who works under the direct supervision of a commercial applicator who is employed by the same company or agency. The trained service person has been instructed in the proper use of equipment and pesticides that will be used on the job. A Spanish language pdf version of the Trained Serviceperson Manual (OSU Bulletin 863-S) is available by clicking here. You may also attend the morning portion of our New Commercial Applicator Training to become a trained serviceperson. Click here for dates and information. Documentation needs to be kept of the employee's training in their personnel file while they are employed with the company and for three years after leaving. If using the Trained Serviceperson Manual for the training, a documentation form is available on page six. Licensed applicator must demonstrate instruction and control over trained serviceperson. Licensed applicators providing supervision must be employed by the same company or agency as the trained serviceperson.